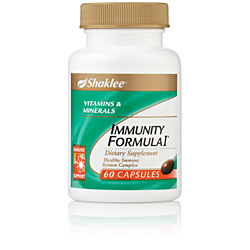 Nutritional Support for Your Immune System. To keep your immune system strong and in good working order, Immunity Formula I provides the essential nutrients for healthy immune function. 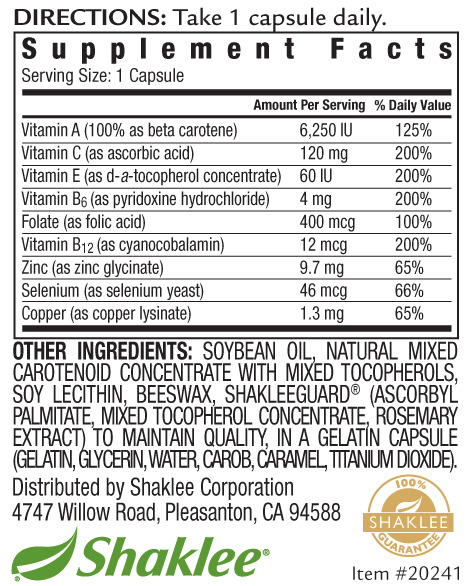 Full nutrition potency is guaranteed with ShakleeGuard®, a patented blend of antioxidants and rosemary extract. Contains a blend of six immunoactive vitamins - vitamin A in the form of beta carotene, vitamins C, E, B6, B12 and folic acid. It also contains mineral support for a strong immune system including: copper, selenium, and zinc. Adults take 1 capsule daily.